The diaper pail is one of the most important investments for new parents, allowing them to temporarily block the inevitably foul odor of dirty diapers for several days at a time. A good diaper pail will effectively seal in the foul odor and prolong the time between taking out the diaper garbage. 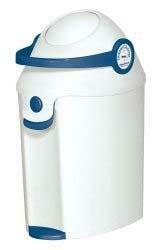 An even better diaper pail will also be durable, reliable, and reasonably priced. To find the best diaper pails we got a group of parents together and did hands-on testing of 14 different diaper pails. Some stank (literally), and some were fantastic. Here are the top 5 results of our research, followed by our in-depth reviews of nearly a dozen different options. For more in-depth details on how to pick the perfect diaper pail, check out our full diaper pail buying guide. Here are the Best Diaper Pails of 2019! Like, really stink, especially if you leave them around overnight. And as your baby gets older, the smell will get progressively worse - by the time they are about a year old, their poop starts to smell really heinous. How do you take care of the problem? The obvious solution is to take your dirty diaper out to the garage, dumpster, or outside garbage can every time you change a diaper. That strategy will work for about a day. Then reality will set in - nobody has the time or energy to take out every single diaper, especially when you're changing your baby every hour or two. You also don't want to be filling up your kitchen or bathroom garbage can with diapers, because that will get really smelly really quickly! Thus, the diaper pail. There are dozens of options. The Playtex Diaper Genie, the Munchkin Step Diaper Pail, the Diaper Dekor pail, the Tommee Tippee, the Diaper Champ, the Ubbi Pail, Safety First Easy Saver, One N Done, and the list goes on. Some of these are convenient, some not. Some great at masking odors, some not. Some durable and reliable, some not. Some requiring proprietary bags, some letting you use whatever bag you want. So many options, and lots of differences between them. Before we start the list, let's get something straight. Nothing other than a hermetically sealed chamber or being upwind is going to stop the stink of soiled diapers. Diaper pails are not miracle workers, they just give you a couple more days before you need to do the inevitable bag change. Keep that in mind - none of these are perfectly sealed stink preventers. It's just not feasible. And every time you open it up to put in a new diaper, you'll see (or smell) what I mean! Also, these diaper pails can be used for disposable diapers (see the best diapers here) or cloth diapers (see the best cloth diapers here), though we suggest using one with great odor containment for cloth diapers given that they cannot be tightly rolled up like a disposable diaper. 1. Munchkin Step Diaper Pail. This is the first year we've reviewed this relative newcomer, and we're happy we did, landing it right at the top of our list! It has a sleek profile, matte white with silver trim, so it doesn't look a typical industrious diaper pail (like the Genie or Champ). It is just over 2 feet tall and uses a great step mechanism to open the top flap. When the flap opens, it also opens the internal bag, which uses a ring-style refill system. When the flap is closed, it uses a unique twist technique to seal the bag shut. Definitely better than the squeeze-shut mechanism. In addition to the Munchkin refill rings, it's also compatible with the snap, seal and toss bags, which is a nice touch. The secret to this diaper pail is that it uses an Arm & Hammer baking soda puck that helps absorb odors, and a mild lavender scent that helps mask any remaining odors. In our testing, we thought this was the best diaper pail for concealing odors. Along with its high capacity, convenient step-open mechanism, and subtle design, this puts the Munckin Step squarely at the top of our list. The biggest selling point is the odor control, which we believe is the most important aspect of a good diaper pail. There are a few functional downfalls with this pail: first, you need to physically push the diaper down into the pail, and second, the lid doesn't close automatically (you push it down to lock). Overall, an excellent diaper pail with just a few drawbacks. It goes for about $65 online. Interested? You can check out the Munchkin Diaper Pail here. 2. Diaper Dekor Kolor Plus Pail. This is a stylish and sleek alternative to the typical (and ugly) Champ and Genie pails. It functions much like the Genie but is a bit more durable. You press the foot lever for hands-free operation, which opens up the top and exposes a square flap hiding the hole where you'll toss the dirty diaper. The flap is a nice touch: unlike the Genie, when you push the foot lever, it doesn't immediately give you a giant waft of odor. That's because the stink is hiding behind yet another layer of plastic. Slick. When you fill it up, you open the front of the pail and pull the bag down, cut it with a little kid-safe blade, and knot it. Then pull down a fresh bag and knot it. Very similar to the Genie in this ring concept for bag dispensing. But much more durable than the Genie, and less stink escaping when you use the foot lever. Our testing moms loved that it was completely hands-free, so you can hold your baby and put in the diaper (the Genie is also hands-free, but the Champ requires a hand). Two moms noted that they bought the Diaper Dekor system after their Diaper Genie broke - usually the flap hinges are the first to go. This system overall is highly recommended, and as a bonus it looks quite a bit better than the others and comes in multiple colors. It's usually less than about $40 online. We did the calculations for you, and the cost of bag refills is about 1 cent per diaper. Note that Diaper Dekor used to make a larger and more expensive "XL" diaper pail but it's been discontinued. Downfalls? Well, it's not as sturdy as the Ubbi, and because it's built with plastic it tends to absorb smells worse than the Ubbi. Also, the odor control wasn't quite as good as with the Munchkin Step. Interested? You can check out the Diaper Dekor Diaper Pail here. 3. Ubbi Steel Diaper Pail. 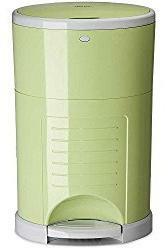 This is an awesome diaper pail, one of the best-rated and best-selling units on the market. And for good reason. Ubbi used steel (much less porous than plastic) instead of plastic to lower the chance of odors being absorbed, along with rubber seals at all the important joints to make sure odors stay inside. In our testing, this pail was quite good at holding odors from dirty diapers, and we think that is the #1 most important factor to consider here. Of course, when we opened it the odor wafted out, but that's like any other pail on the market. This pail allows you to use any bags you'd like - when we tested it, we used standard tall-size kitchen bags. We think the Glad OdorShield Febreeze trash bags are excellent for this, and they are pretty reasonably priced. The lid is the only one that slides open, which is not quite as easy as the Dekor or Genie, but more manageable than the Tippee when you have a diaper in your hand. Slide the lid back, throw in the diaper, then slide it closed. This diaper pail is very sturdy and feels well-constructed. It has a baby-proof knob on the top to prevent kids from opening it up entirely. Emptying the bag was easy, lifting the lid and the ring, and then simply tying the bag and pulling it out. Overall, this is a great diaper pail, and the only real downfall is that it doesn't have a foot pedal. But if you have any issues with it, Ubbi is super responsive and has a track record for excellent customer service, so send them a message and they will fix any problems you have. Interested? You can check out this Ubbi Steel Diaper Pail here. 4. Baby Trend Diaper Champ Deluxe. It was a hard decision to make this #6, as it is basically tied with the Diaper Genie (below). The Diaper Genie and Diaper Champ are the most common diaper pails money can buy - they are at all baby stores, and they do a pretty decent job. The biggest distinction between the two is that the Genie isn't very well made and tends to break after 6-8 months of use, and the Champ doesn't have a hands-free operation. The Diaper Champ uses a handle that you pull up on to expose a little pouch where you place the diaper: when you push the handle down, the pouch turns upside-down and drops the diaper into the pail. Clever design, especially since you don't need to open the pail and expose all the dirty diapers to the air. Our moms said that the Champ blocks odors considerably better than the Genie, mostly because it doesn't open up the entire pail every time you use it. Another huge bonus they mentioned is that while you can certainly use the Baby Trend Diaper Champ refills, you don't need to: you can use a regular size kitchen garbage bag, and it works just fine. Since you can use your own garbage bags and the smell is a bit better contained, the Champ beat out the Genie by a slim margin. The Champ usually sells for less than $50 online. Comes in pink or blue. Refills amount to about 3 cents per diaper. Interested? You can check out this Baby Trend Diaper Champ here. 5. Playtex Diaper Genie Elite Pail. This is roughly tied with the Diaper Champ, but we thought the Champ just marginally edged out the Genie. Maybe it just depends on what you prioritize in a diaper pail. If you really want a hands-free operation, you need to go with the Diaper Dekor or the Diaper Genie, which both let you hold your baby with one hand and the dirty diaper with the other, and press a convenient foot lever. The Genie is a great product, and has a nice operation, and does a decent job containing odors. But it also doesn't contain odors quite as well as the Champ or others, maybe since it only has one layer of plastic (the top flap) between your room and the bag of diapers. The Diaper Dekor has 2 layers, and the Champ uses a rotating pouch system. 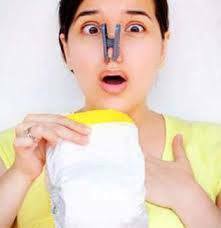 But if you don't know any better, the Genie does a decent job containing odors and features super convenient hands-free operation. Our moms also pointed out, however, that the Genie is not the most durable system, and several moms mentioned that hinges holding on the top flap/lid broke after less than 1 year of use. It also requires you to use their refill rings. By comparison, the Champ doesn't seem to ever break, and you can BYOB (bags not beer, of course!). The Genie is usually less than $50 and refills amount to about 2 cents each. Interested? 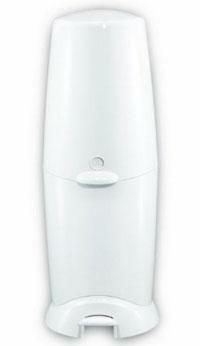 You can check out this Playtex Diaper Genie here. This is the newest mainstream diaper pail on the market and we got our hands on it for testing in early 2019. And there were some impressive features. First, like the best diaper pails on this list, it uses a foot pedal that you push down on to open up the top flap, which lets you use it one-handed. Like the Diaper Dekor, there is a second spring-loaded flap hiding under the lid, which you will push down with your hand and the diaper (that helps keep the stink in!). Second, the top lid has a soft-close function, like the ones on kitchen cabinets, that prevents it from slamming shut. Third, it has a sleek and low profile so it doesn't take up a lot of space in your room; we were able to fit it easily under our changing table, or in the corner in our bathroom. 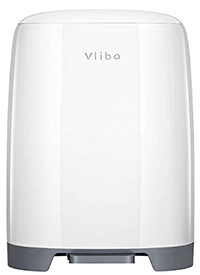 Fourth, it comes with a big set of Vliba diaper pail refill bags that should last you about 4-5 months depending on how frequently you change diapers and how big the diapers are. After you get through those bags, the refills cost about 40 cents each which is pretty pricey (a box of 50 refills costs about $20). For reference, the Ubbi refills are about 25 cents each. The bag system works differently than many of the more popular diaper pails on this list - rather than it using a diaper refill ring that has a really long bag in it (that you cut and tie yourself as needed), this uses actual small bags. We'll return to that aspect a little later. In our testing, we thought this diaper pail did a reasonable job keeping the smell contained, though not quite as well as some of the front-runners on this list. We thought the foot pedal was easy to use, the inner flap was easy to push down when putting in a diaper, and the flap swung back up pretty tightly to seal in the odor. The overall build quality was pretty good, and we think this diaper pail would definitely last several years. So now for some of the cons - three of them to be exact. First, it just doesn't have the capacity of a larger diaper pail. They claim that you can fit 45 newborn diapers into a single bag, but in our testing we were able to fit about 25-30 tops. That brings us to our second issue: because this diaper pail uses bag refills, you can't really fill it to the max without the bag becoming impossible to tie off when it's removed. If you really tried to fit 45 diapers in it, there is no way you would be able to remove the bag and tie the top, instead you would have an over-stuffed plastic bag of diapers that would just smell really bad and spill all over the place. Finally, emptying the Vliba diaper pail was a very involved process. Instead of having a front door that swings open like the Diaper Dekor, you have to push a button on the side and pop the entire diaper pail in half. That part is easy enough, but good luck trying to get it to close back together - that was a total pain. 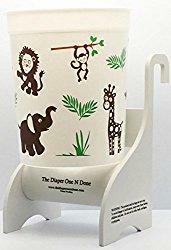 Overall, we liked this diaper garbage can and thought that it is a good addition to our round-up list, but the smaller size and the refill process leave something to be desired. But did we mention how sleek and cute it is? And the fact that it comes in like six different adorable colors (like baby blue, pink, black, white)? Definitely one of the better looking diaper pails on this list, but is it worth the cost of about $60-70 depending on colors? We'll let you be the judge! Interested? 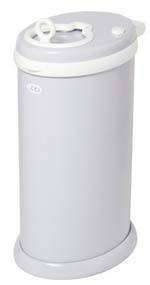 You can find the Vliba Diaper Pail online here. 7. 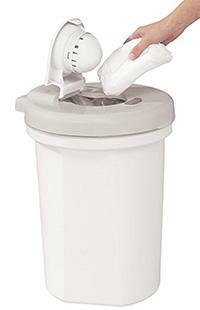 Safety 1st Easy Saver Diaper Pail. We finally got our hands on one of these Easy Saver diaper pails, and put it to the test. We actually hadn't seen it around on the market, and it wasn't until one of our Facebook fans told us to test it out. Overall, it's good enough to make it onto our "best diaper pail" list, but it's definitely not up to par with the others. Let's get into the positives first. It lets you use your own tall kitchen garbage bags (the 13-gallon ones), which is really convenient so you don't need to buy separate refills. It also includes a baking soda deodorizer disk that fits into the underside of the top flap. So that does help with the stink quite a bit, until it runs out and you need to replace it. The design is sleek and simple, and the mechanism seems to be decently high build quality and reliability. So, there are definitely some positives, especially given the low price for a diaper pail (about $17 or so online). But we also found some negatives. First, to open it you need to use a small button on the top, which pops open a flap that you stick a diaper into. It works just fine, but we really prefer the foot pedal style, it's just so much easier to use when you're already carrying a baby in one hand and a dirty diaper in the other! Second, the odor control wasn't quite as good as some of the better ones on this list, especially when the deodorizer ring needs to be replaced. Third, we thought the hole on the top was way too small and awkward to put a diaper into. It's mostly because the bulge on the bottom of the lid flap is so big, that it makes it hard to fit a diaper in. It's kind of a nuisance. And then you need to push it shut after opening it. So definitely some cons relative to other diaper pails on this list. But if you're looking for a well-built diaper pail on a budget, this is definitely a great option. 8. 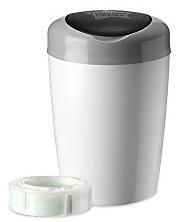 Tommee Tippee Simplee Diaper Pail. This was new for the 2016 model year, introducing Tommee Tippee's first venture into the diaper pail market. Tommee Tippee is known for making high quality, reliable, safe, and inexpensive products; their products make it onto many of our top 5 lists, such as with their awesome baby bottles. The Tommee Tippee pail is most comparable to the Diaper Dekor product, using the ring-shape refill cartridge and having a nicer style than the Genie or Champ. Also, like the Dekor, it uses a two-layer odor protection: the top lid that pops up, and a small flap that you push the diaper through in order to get it into the bag, which helps you avoid the waft of diaper odor whenever you open the top lid. Unlike the Dekor, however, this unit requires you to pop open the top with your hand (there is no foot lever on the bottom); that is why this is #3 on the list, since the Dekor is a bit more convenient in that regard. The Dekor and Ubbi lids are much more manageable. However, right now this pail is the cheapest on the list, coming in at around $20 online. While this system is not quite as good as the Ubbi or Diaper Dekor, it is much cheaper. Also, we did the bag refill cartridge calculations for you, with the cost of about 2.5 cents per diaper. 9. The Diaper One N Done. Don't let the picture fool you, this thing is really compact! Here's a new entry into the diaper pail market, with a very different strategy. Instead of having a separate large container to store diapers, this system lets you use your existing garbage can. It reminds us a bit of having a puppy: you individually wrap each offensive item into a small plastic bag, then throw in the garbage. The Diaper One N Done is substantially smaller than any other diaper pail on our list. Because it's not really a diaper pail. It combines a perforated roll of bags, much like those little doggie clean-up bag rolls. You open a new bag and put it over the pail edges (similar to what you probably do already with the bathroom garbage can!). Then you put a dirty diaper in, tie it, rip the bag off the roll, and put a fresh new bag over the edge. Then you throw the bagged diaper into your regular garbage can. It seems like a bit more work, but here's how our interviewed moms saw it... first, the system is about half the price of the others. Second, since you're using your regular garbage, you don't have to worry about taking out yet another pail full of garbage. Third, since it's bagged and tied, the stink actually does an OK job staying in the bag. Fourth, it is a really small pail that can sit on top of your changing table, or use the hook so you can hang it on the side. So, there are a lot of positives with the Diaper One N Done. The negatives? Well, if the Champ is unfortunate because it requires 1 hand to operate, the One N Done really loses out because it requires both hands to tie the bag and put on a new bag. But if you foresee yourself being able to put down your baby while you tie the bag, then this is the system for you. It's about $30 typically online. We did the math for you, and the cost of refills is about 6 cents per diaper.